At the time of day when the inky west Bali ocean folds in bands of tangerine, a brawny body adorned by tattoos paddles out on his surfboard. He has a bundle of plastic containers and fishing line nestled under his neck. He smokes a clove cigarette. Somehow he keeps it dry enough to smoke while traversing the white wash. When he gets out the back, he sits up straddling the board, smoke in mouth. He faces the roaring sunset the west coast of Bali is famous for. He soaks up the sky’s colors that gild him in flaming gold. He pulls sardines from his board shorts’ pocket and hooks them to the lines at the end of the containers. With a slow rhythm, he places the containers in the water around him like he’s making an offering. They float off strung together but freely drift wherever the ocean takes them. Then he goes surfing. Two years ago 34-year-old Putu, husband to Ilu and father of two boys couldn’t afford to buy fishing net and certainly not a boat. His ding repair business was going through a quiet period. 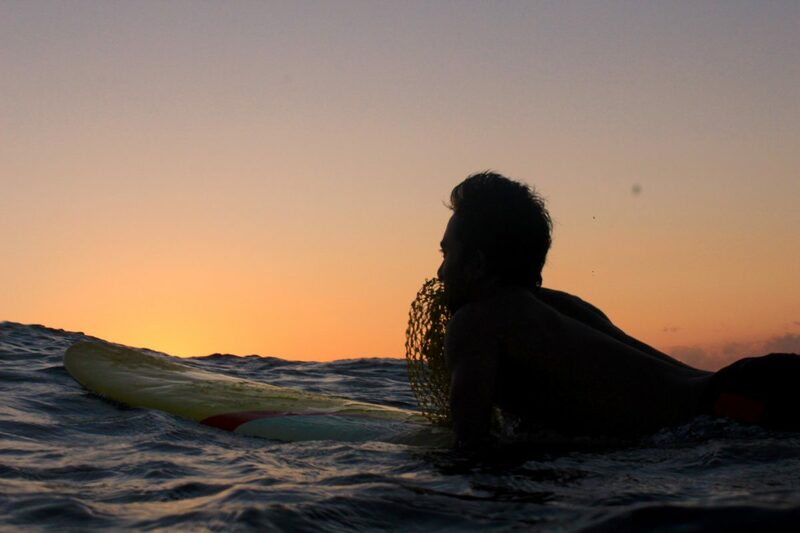 He tried fishing with a rod from his surfboard, “but I wasn’t really comfortable,” Putu said. “I Googled ‘how to catch a fish with floating’… ‘floating,’ like with a plastic bottle or jerry can. So I try and it worked! That’s why I still use now,” said Putu. 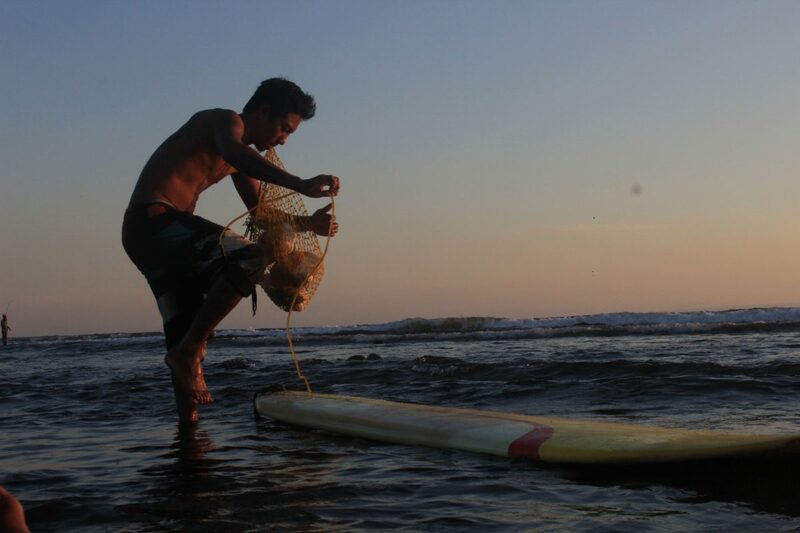 When he’s done surfing, Putu paddles over to where the floats have drifted. In the afternoons he catches red snapper. But sometimes something bigger is on the line. One month ago he caught an 18-kilo giant trevally (GT). “My floating lines went far away… about 50 metres then, BOOM! I tried to grab the lines, but they were still going far away. It made me scared because it felt like someone was pulling me — fast, like jet.”He tells me, laughing. After catching the GT, Putu laid the big fish out the front of his home for his neighbrs to admire. “That was my best fishing experience,” Putu said. Putu is a son of Bali’s tourism revolution. Bali’s tourism boom exploded in the1970s after the international airport was built.The influx was spurred-on with the release of two legendary surf films, Morning of the Earth (1972) and the BBC’s Balinese Surfer (1976) which unveiled to the world Bali as the new surf frontier. In the ’70s more than 20,000 foreign visitors entered the island with more than 1000 being surfers. In 2018, the Balinese Tourism Board set a target for 6.5 million foreign visitors. Putu was born to parents who worked in hotels all of his life. At 60-years-old his father is still a groundskeeper at one of the hotels on Medewi point. Medewi is a Muslim village, one of few in Bali. Enormous electric-pastel mosques mark the road like giant birthday cakes. This is a surprising sight in Bali. Bali is Indonesia’s only majority-Hindu island nestled in the largest Muslim nation in the world. Putu’s parents are Hindu. Despite this they moved to the Muslim village when Putu was seven. “We are all ok together [Muslim and Hindu]. We help each other. I feel really safe here. All the people here care about me,” said Putu. Medewi is three hours northwest of Denpasar. 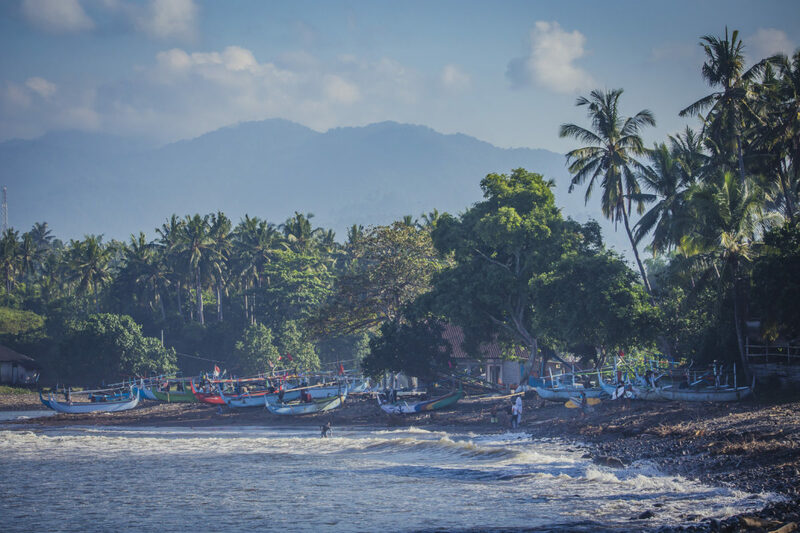 The village hugs the black-sand beaches on the coast side of the transport road to Java-bound barges and ferries. Tourists come to sleepy Medewi for its mellow vibe and long waves surrounded by a soothing hum of village life. Its main break is the longest left-hand in Bali. It can give a two minute ride in the right conditions. It also has a shorter, punchier right-hander next to the left and quality beach breaks close by. It’s a great surf spot for beginners. 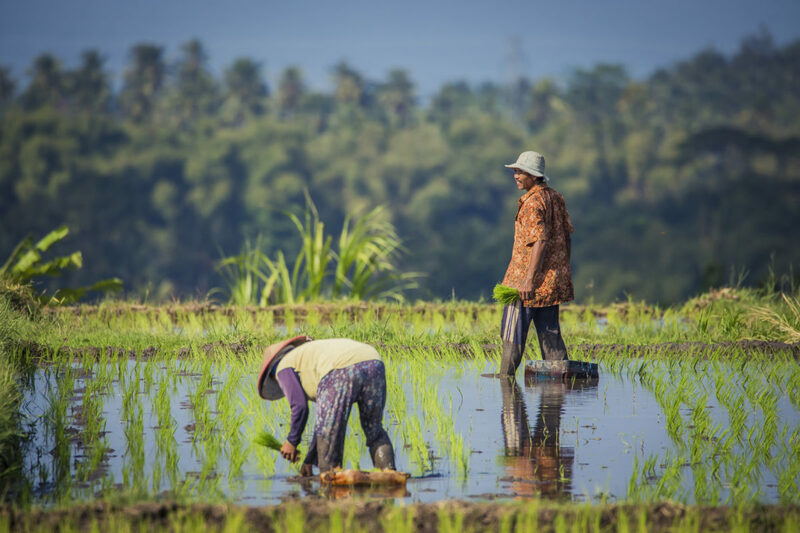 Bali’s Jembrana region where Medewi resides is home to some of the oldest rice agriculture areas in Bali. A late afternoon scooter ride through the golden-lit inners has you weaving through rich jungle, eye-popping green rice paddies and dream-like Balinese family compounds. You might see a group of women bathing naked in a river or a grandfather taking a stroll with his little grandchild. An old order of things echoes in the surrounds, giving you a feeling of breezeless calm. “I’m from Medewi: I feel Medewi, I am Medewi,” says Putu. 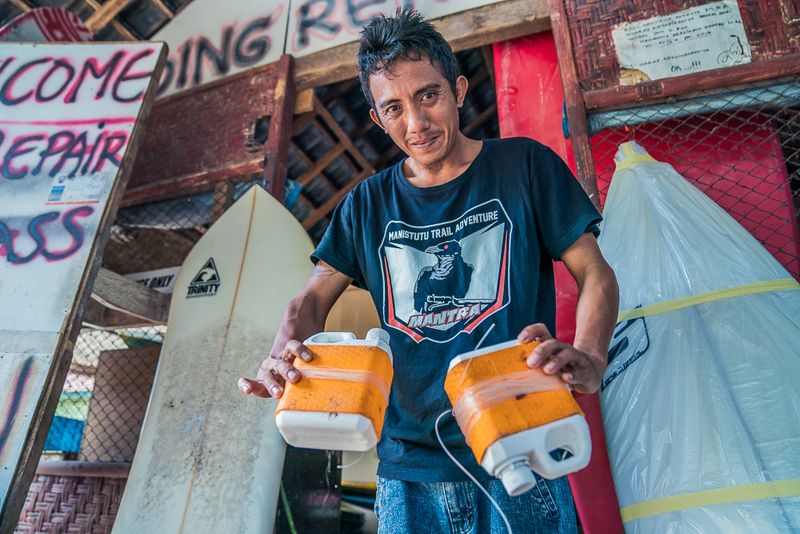 Putu’s fishing practice embodies a laidback approach— a style recognizable in many surfers. And like Medewi, a fishing village that took advantage of surf tourism without losing its nature, Putu also has a natural ingenuity—that flows with the tide not against it. About the author: Ali Almond is a freelance journalist who lives in Western Australia. She has a long affair with Indonesia and travels there often. Follow her @ali_raw_flow.